Smartphone unit sales are soaring, with sales almost tripling between 2004 and 2005, and increasing a further 50% in the first half of 2006 compared to the previous year. Figures revealed by the high-tech market research firm In-Stat reveal that the Windows Mobile operating system has now managed to grab an equal slice of the US market share with smartphone big boys, BlackBerry and Palm. Bill Hughes, an analyst at the research firm says that much of 2005’s soaring smartphone shipment growth was down to a run on Linux-based handset shipments in Asia at the end of the year. However, he’s a bit sniffy about calling these phones – mainly from Motorola, NEC, and Panasonic – proper smartphones because they don’t possess the same high end functionality seen in Windows Mobile, Blackberry, and Palm OS devices. Although the Linux-based handsets are capable of running Java-powered applications added by users, Hughes reckons they should really be called ‘feature phones’ rather than smartphones. Despite the spectacular sales, Hughes advised caution, pointing out that many smartphone users continue to lug around the very devices that smartphones are supposed to replace. “Also, users have been slow to add new applications to their devices. Most users have only downloaded a few applications,” he added. Other research by In-Stat found that business users given work phones were three times more likely to carry a second phone for their personal calls than other users. Google Maps for Mobile now officially supports GPS location information when used with mobile phones … well at least one of them at the moment, the Helio Drift. We’ve been covering running Google Maps/Local on mobiles for about a year since we heard about Cristian Streng discovering that GPS was supported within its program code, back in November 2005. 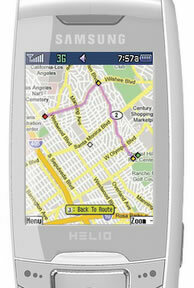 Helio would broadly be called a mobile phone operator – but they specifically request, “Don’t call us a phone company”. Helio is a joint venture between SK Telecom (South Korean telco) and Earthlink (US ISP) that doesn’t have their own network, but are a 3G Mobile Virtual Network Operator (MVNO), utilising other networks. Given Koreas long lead in mobile and specifically digital networks, it’s a pretty interesting company. Having your position automatically fed in to a mapping application brings in considerable advantages to any mapping application. When you’re in an unfamiliar city, you don’t have to struggle to find out where you actually are, then try to punch it into your phone. Then, as you make your way to your destination, your phone position is updated, giving you the assurance that you’re not walking in the opposite direction. Other advantages for Google including the users of the service writing/blogging about the location they are in – generating more content for Google, but importantly information that is anchored to a place/location. Google official application isn’t the only other option. There are other that currently work with GPS. MGMaps support many external GPS devices over bluetooth, and internal GPS on some phones. It would be interesting to see what the deal between Google and Helio is, as it appears that Helio have an exclusive on this offering … at last for a while. Backed by a $25 million marketing campaign – their biggest marketing campaign in half a decade – Palm is hoping that the lower priced Treos will attract customers beyond their traditional business base. 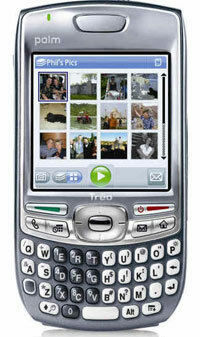 The Treo comes with a large and bright 320×320 screen and the well regarded full QWERTY keyboard, with a raft of multimedia functions including an integrated digital camera, Bluetooth 1.2 , MP3 player, video recorder and player. Onboard, there’s 64MB of user-available storage – nearly three times the capacity of the original Treo 650 smartphone – with expansion card support up to 2GB. Although the Treo 680 is still lagging behind with the latest technology – there’s still no W-CDMA or Wi-Fi support – its superb user-friendly interface still puts it streets ahead of some higher spec’d phones. Like its Palm OS predecessors, the 680 displays text-messaging conversations as IM-like “threaded chats,” a fabulous feature that should be introduced by law on all phones. 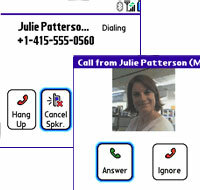 The phone also lets users respond to calls by firing off a preset text message (“bog off weird stalker person”), and there’s support for three-way calling. Along with the usual bundled applications for e-mail, Web browsing, messaging, multimedia, calendar and contacts, there’s a special version of Google Map for the Treo. Billed by Google as,”the fastest, slickest version yet,” the application offers real-time traffic reports, detailed directions, integrated search results (search for cafes/bars etc, get addresses and call them with one click), satellite imagery and fast-downloading detailed, draggable maps with translucent pop-up balloons. Palm has also announced that it will be partnering with several media companies, including Yahoo, Google and blogging firm Six Apart, to make their products available on the new device – these will join the enormous back catalogue of commercial and free software that’s already available for the OS. Palm head honcho Ed Colligan said he expects the new smartphone to be available around the world by the end of June, 2007, “competitively priced with comparable smartphones in the marketplace,” with the price rumoured to be around the $200 mark. Although PDAs may be a dying breed, they clearly ain’t dead yet, with the lesser known Spanish electrics company releasing no less than two spanking new GPS-enabled PDAs. 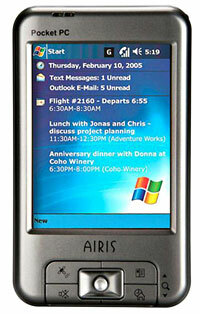 Running on Windows Mobile 2005, it has to be said that the Airis units aren’t exactly lookers, but at a retail price of €220 (£148) and €289 (£195) respectively, they look like chuffing great value. The new T610 and T620 models both include the well respected SiRFStar III GPS chipset. Lurking inside is a nippy Samsung 2440 400MHz processor, backed up by a healthy 64MB RAM and 128MB ROM. The T610 and T620 are cosmetically identical, with both being enclosed in a bland, grey plastic case offering the usual four navigation buttons supplemented by a mini joystick. Both PDAs come with a 3.5 inch TFT 320 x 240 pixels/65k colours touch screen with anti-reflective coating, with the units offering WAV, WMA, MP3, WMV, MPEG4, DivX4 and DivX5 support. A Lithium-Ion 200 mAh battery should keep the thing purring along for hours, with the T610/T620 weighing in at 170g and measuring 15.6 x 72 x 17.8 mm. A mounting kit, car charger, and a smart leather case round off the feature set, with the units being available from this French site. We couldn’t find any UK distributors. 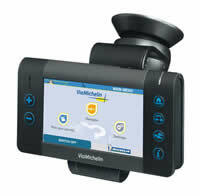 ViaMichelin is the part of the Michelin group that designs, develops and markets digital travel assistance products. They already have a successful Website that uses information from the Michelin Guide allowing visitors to plan their travel and routes utilising the Guide info. They have also moved into providing the information into other areas such as mobile and SatNav products, the latest being the X-980T Europe. The X-980T has a bright 4.3 inch display surrounded by about a 1 inch plastic border, making the unit about 6 inches long and 4 inches deep. It’s just under an inch thick. It’s quite big, however it will fit into a pocket unlike TomTom, their main competitors. 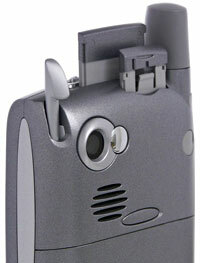 The unit is due for release mid October and will have an RRP of £449. It’s not the prettiest unit out there, but it comes packed with lots of features. There’s a complete set of European maps on the provided SD card, as well as the complete Michelin Guide which lists 51,000 European hotels and restaurants and the Green Guide which has 19,000 tourist and cultural sites. There’s quite a bit of information about the entries including the guide’s rating. 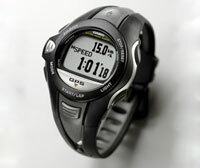 It uses the latest Sirf Star III GPS receiver, which acquires satellites quickly and maintains a lock on them. While testing the unit (inside a bus, in central London) it managed to lock on to 6 GPS satellites which is pretty good. The system also comes with an RDS/TMC traffic decoder built-in (it needs an external aerial for it to work though) allowing it to update traffic in real-time without paying for any subscription services. The navigation software can be set to prompt the user if a traffic alert comes in that will effect the route, or it can automatically re-navigate to avoid the problem. There’s also a speed camera database for the UK (which isn’t actually available yet, but will be in late October) and other countries. Again it’s included in the price (as are updates). Bluetooth is also included and the system will act as a hands-free kit for a Bluetooth enabled phone. This also ties in well with the Michelin Guide information, by choosing a restaurant the system can navigate there, and as the phone number is also included – dial through the phone and you can reserve a table. The voice directions are pretty normal, but there’s also a text to speech engine which can be used instead which will read out the names of roads and points of interest (in the language the device it set to). An “infinite” number of stop-offs may also be included in a route for visiting all those tourist attractions. Even as a straight SatNav it boasts a lot of extras, like the included subscription free traffic and camera databases, but it’s the Michelin Guide that makes it something different. However that won’t appeal to a lot of people just working out how to get from A to B. If it’s going to be used for business or fleet use, or planning a holiday, then the Guide may prove invaluable. The screen doesn’t seem as crisp as on some SatNavs, but it’s definitely pocketable so could be used when leaving the car and navigating somewhere on foot. Though it’s a good unit, it’s just not quite ergonomically right. Although we’re not alone in thinking that the Palm Treo is the best smartphone around, the device suffers from one tragic omission; Wi-Fi. 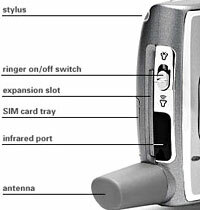 Seeing a sizeable hole in the market, Texas tech company Enfora released a WiFi Adapter for the Treo, unusually shaped in a ‘sled’ design, bolting on to the back of the Treo rather than using the SD card slot. Tearing open the box with gay abandon, we found the adapter (smaller than we imagined), an AC adapter that conveniently offers four different international plugs, an installation CD and the flimsiest instructions we’ve seen for some time – just a tiny scrap of paper. There’s also a custom battery cover for the Treo which has two slotted holes for attaching the phone to the sled. 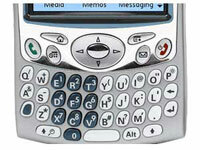 Aesthetes may be offended to note that it’s a different shade of silver to the Treo. Once you’ve changed the battery cover you have to pull the button on the sled, give the Treo an almighty shove downwards and then click the phone back into place. The first few times we tried this, it took so much effort to pull the phone in and out of the sled we began to fear we’d end up breaking the thing. As soon as you locate your network, you have to select ‘add’ to create a network profile and then input IP information and WEP passwords (if needed) and then hit ‘connect’ and you’re online. Although this is fine if you know what network you’re looking for, the software for ‘sniffing’ connections is rather woefully Spartan, with no indications whether located networks are open or encrypted. We did write to Enfora (who have excellent customer support by the way) and they said that they couldn’t justify writing a brand new Wi-Fi sniffer application for what is basically a niche product. Although the Wi-Fi Sled is nowhere near as big as we thought, you’d still feel a right berk making calls with it attached, so a headset is a must (see our BoxWave Dual Handsfree Stereo Adapter review). 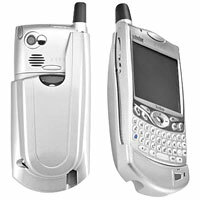 Happily, the Enfora has been designed so that you can still use the audio port on the Treo and there’s a microphone on the front of the unit so you can receive calls while surfing the web too. Conveniently, the Wi-Fi Sled’s AC adapter will also charge the Treo when it’s in situ, so you won’t need to drag around two adapters on your travels. It has to be said that although it feels a bit of a bodge, it actually works very well and for users who need to combine the slick functionality of a Treo 650 with the speed of a broadband Wi-Fi connection, the Enfora WiFi Sled is well worth the money (approx £106/$170). Once connected, we had no problems hurtling through our email and whizzing around Websites and although the pocket-filling girth didn’t thrill, the additional battery life meant that it may prove far more practical for road warriors away from base for lengthy periods. Most GPS enabled watches we’ve seen so far have been so ridiculously chunky that you’d need the muscles of Mick McManus to stop your arm dragging to the floor under the weight. However, Casio’s sleek’n’slinky new GPR-100 is a GPS-enabled watch that manages to pack in all that clever satellite positioning technology into something that actually resembles a normal watch. 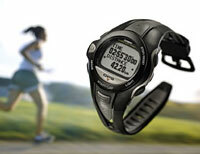 Designed for hi-tech sporty types with an appetite for stats, the waterproof wristwatch checks in with GPS satellites to calculate the time, speed, distance and pace of your run, with the ability to set performance-related goals while you distribute sweat all over the neighbourhood. We’re working from a Japanese translation here so the details aren’t entirely clear, but it seems that positional points can be inputted, with the watch able to calculate the direction and distance from your present location. There’s also a calendar, a stopwatch offering lap/split, running time, travel distance, average pace, distance inside lap, pace inside lap, an alarm and a backlight inside the 64g watch. Despite its GPS abilities, the watch can’t display maps or offer latitude or longitude information on its tiny 49×72 full dot LCD screen, so there’s no chance of the bleeping t’ing guiding us home after a heavy session in the pub. There’s no denying that it’s a mighty feat of miniaturisation to wedge in so much functionality into the Casio’s diminutive proportions (63.1mm×49.5mm×17.1mm), but – yowch! – that cool portability comes at a jogging pants-tightening price: ¥54,000 ($476). 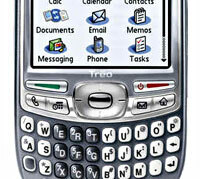 For a self confessed, gimme-gimme-shiny-new gadgets nutcase like me to be using a phone several years old speaks volumes of the strengths of the Treo 650. It’s not a perfect phone by any means, but after trying out various Nokias, Pocket PCs, Motos, Sony Ericssons and other wannbe contenders, I’ve come to the conclusion that the Treo remains the best smartphone on the market. It’s not for everyone of course, but after a recent weekend in Wales, I realised that I had in my possession the first smartphone that was actually clever enough for me to leave my laptop at home. Despite being out in the wilds of lovely Cymraeg (with ne’er a wisp of Wi-Fi in the air), I was able to download images for approval from a client; download, edit and send off a Word doc; surf the web; chat with some friends on IRC; send and receive a ton of email; download weather forecasts; read RSS feeds; play some games; update my blog; send text messages; take pics and a few silly videos and, of course make and receive calls – and the Treo performed faultlessly throughout. If I’d have taken my Windows Mobile phone I dare say I would have been very well acquainted with stylus (and the reset button) by this time, but the Treo’s fabulous one-handed operation and rock solid performance made it a practical laptop replacement. After Palm decided that it wasn’t worth the outlay to re-jig the Treo to fit incoming European regulations, there sadly won’t be any more 650s shipping to the UK, although there still should be plenty about – especially on ebay. In the US, Palm has already released the 650’s successor, the Treo 700p, but it looks like us here in Euro-land are going to have to wait till around Christmas for an updated, antennae-less Treo to appear. Possibly. Palm has remained tight-lipped about their European product roadmap, with the web rife with rumours of both Windows and Palm new models going under ggroovy codenames like Hollywood, Lowrider, Nitro and Lennon. Vodafone UK, however, have recently confirmed that they will be launching a Windows Mobile 5-powered 3G UMTS Treo at an unspecified date, but we’re not interested in that. 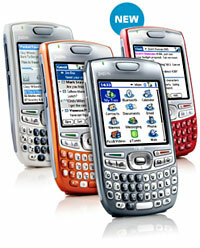 We want a much needed fix of new Palm gadgetry, running a Palm OS! Following on from Part One, published last week. As its rivals continue their crash diets and squeeze into ever-smaller designs, there’s no doubt that the Treo’s beginning to look like a bit of a lardy boy these days (although it’s by no means the biggest smartphone out there). Of course, one of the problems with smartphones is that if you try and shrink them too much, usability flies out of the window. 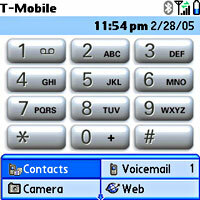 Smartphones, by definition, need a big bright screen to fit all the information in (and at 320 x 320 pixels, the Treo’s got one of the largest displays around) and there’s a human limit to how small you can make a keyboard. Some smartphone makers have tried to get around this limitation by getting rid of the keyboard altogether and using an onscreen ‘soft’ keyboard instead. Although this allows designers to make super-small smartphones, the lack of a proper keyboard is – to quote Clint Eastwood – some price to pay for being stylish. Soft keyboards are absolutely horrible to use. Apart from the fact that your screen rapidly turns into a smudgy mess, they’re simply not as effective as a proper hardware keyboard, and after using both, we’d certainly never again invest in a smartphone without a proper keypad. 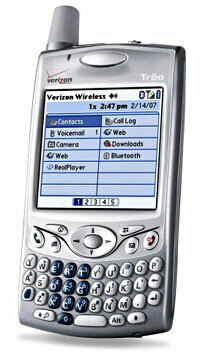 Despite its ‘built for comfort’ shape, the Treo still feels pretty good in the hand, with some of the best ergonomics around – changing the SIM card, for example is an absolute breeze compared to most phones (just use the slide out tray, accessible from the top of the phone), and it’s the same story for the SD card. Volume controls are where they should be – on the side of the phone – and muting the phone entirely is simply a case of sliding a switch in the top of the phone, a feature that is inexcusably absent in almost every other phone. It’s not all good though, with the Palm designers needlessly forcing users to take off the back of the phone whenever a reset is needed. And then there’s that great, chunky monolith of an antenna that’s bolted on to the phone. Funnily enough, it seems that most Americans actually like antennas on their handsets, but we can’t say we’re too keen. Of course, pretty looks and bright screens are one thing, but it’s how the thing works as a phone that matters most and here’s where the Treo excels. When someone new calls you up, a great big button comes onscreen at the end of the call asking you if you want to add the number in your phonebook. Simple. Straightforward. Obvious. 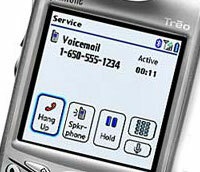 If you want to switch to the speakerphone during a call, just press the ruddy great onscreen ‘speakerphone’ icon. No holding down keys, no shuffling about in sub-menus or fiddling about with switches like a Windows phone. If you want to see who’s called you, just press the green call button twice and a list of calls comes up. As you scroll down the list, context sensitive buttons appear, asking if you’d like to add the unknown numbers to your contacts, or if you’d like to send a SMS message to known contacts. If you want to find out more, click on ‘details’ and you’ll get the exact time and duration of the call. Looking someone up in the address book is just as simple – just type in their initials and you’ll go straight to their entry. The whole phone is designed for effortless one handed operation, meaning you can use the phone on the move while most Windows Mobile users will be left reaching for their itty-bitty stylus or fiddling about with slide-out keyboards or ‘soft’ onscreen keyboards. Get ’em quick before they go! Note: since we started this piece, Palm have announced that there will be no further European shipments of Treo 650s as the phone breaches new EU regulations. However, the company claims that it has already sent enough Treo 650s to meet demand for now, although US users can already indulge themselves with the newly released Treo 700p offering EVDO. Palm has said that its next Treo smartphone will be targeted at European markets, although it appears that it won’t be a GSM/UTMS version of the 700p. 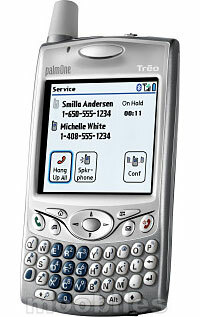 Instead, Palm are rumoured to be developing an antenna-less Treo for the European market, possibly to be called the Treo Nitro (thanks to the valued reader who pointed this out to us – you know who you are). Palm CEO Ed Colligan has suggested that the new model is unlikely to become available until Palm’s 2nd Quarter in FY 2007 (around October – December 2006). Readers sufficiently enthused by our comments should look on eBay where there are ample new and reconditioned Treo 650’s available for between £170-£280 (that’s where we got ours from!). 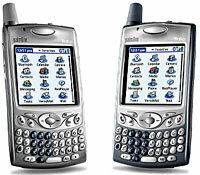 Coming up in part three: Palm Treo multimedia and office apps. Ofcom has just issued guidance that GPS repeaters are probably illegal in the UK, both in their use and their sale. Medium term this action could hit the wave of GPS-equiped mobile phones that are a year or so away, and the location-based services that they’ll bring. GPS repeaters use radio signals to pass Global Positioning (GPS) or other Radionavigation Satellite system (RNSS) location information between units. Unless the operators have specific licenses, they be breaking the law in the UK. 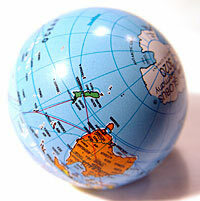 GPS devices need to be able to receive the positional information from satellites. Initially this involved having line-of-sight to the ‘birds’, but as chip-sets have improved, they’ve become more sensitive, so requiring less direct sight. If GPS units work within buildings, they do so at the sacrifice of accuracy. Even with the chip improvements, GPS will not work within buildings, and certainly not underground. We spoke to Jenny Bailey, Technical Director of J-Squared to get the low-down. J-Squared were funded by the DTi 3 years ago to develop a GPS repeater system, which they subsequently received a patent. Jenny told us the major current use for GPS repeaters is by the emergency services. Ambulances stations are equipped with them to ensure their on-board GPS ‘know’ where they are as they leave, speeding them to their location. Police and firefighting services also benefit from being able to locate their personnel within buildings. In the medium term, Ofcom will create quite a kerfuffle with this ruling. Mobile phones will, within a couple of years, be commonly equipped with GPS, enabling location-based information and services. These will not work within buildings without GPS repeaters, knocking their broad usefulness on the head. We’d imagine that the mobile companies will be on the phone to Ofcom sharpish. Ofcom is becoming increasingly stringent on the ‘unauthorised’ use of radio spectrum. One of their Big Ideas is to auction off radio spectrum to the highest bidder and if people are using it without paying for it, the whole idea becomes undermined. Given the inevitability of the march of mobile phones, it could be that Ofcom are acting as King Canute, but in this case attempting to hold back radio waves.